I hope this gives you an idea of the time frame of the sew-along, and a chance to prepare for it. Don’t worry if you can’t follow the whole process through, as all the steps will be kept on the blog so you can always refer back to it. Renee from Me Made Makes! I'll be in touch shortly to get your postal address for this lovely pencil skirt pattern. Hello friends, Happy Chinese New Year! I hope the year of the goat will bring you all great energy, perfect health, and wonderful sewing mojo! Here's something you may or may not know already. In China, the lunar new year is called "Spring Festival", which celebrates the end of winter and the start of spring. This makes a lot of sense as the lunar calendar was and may still be relied on by the farming communities, so a new year to them would begin when spring arrives. So if we were to have faith in my ancestors, spring is just round the corner. 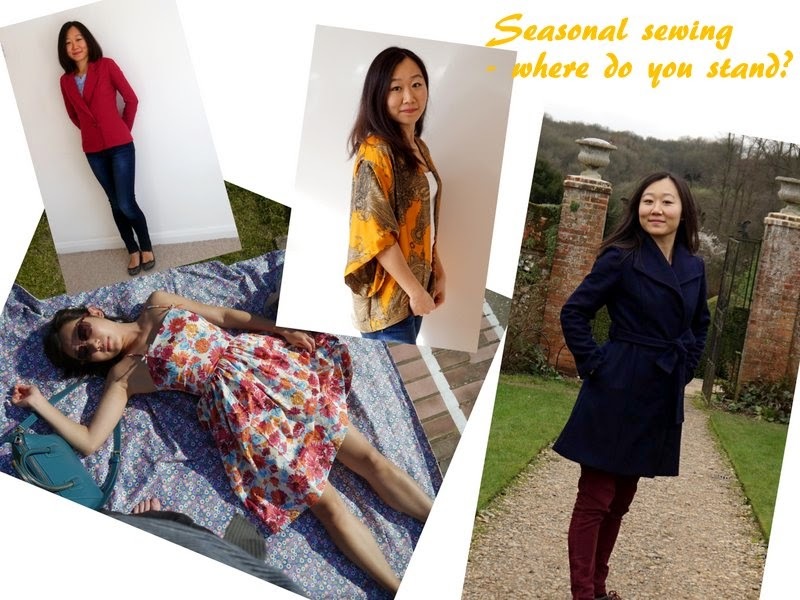 What better time to talk about seasonal sewing than the beginning of the four seasons? Allow me start off the discussion. I, for one, really am affected by the seasons when it comes to my sewing habits. When autumn approaches, I suddenly feel the pressure to squeeze in the "last summer dress for the year". Because of this, despite my long-held desire to make myself a cool mac for spring and autumn, I have managed to let springs and autumns pass me by as I was busy making warm weather clothing. Then winter arrives, I suddenly find myself with a lot more time to sew. Normally I engage in some "off-season sewing", making items for the next spring, but I am proud to say that I actually managed a couple pieces of cold weather garments this winter - a wool coat and a plaid skirt! The result has been so rewarding, as I was able to wear them straight away! After all this blurb, I suppose what I'm really trying to say is that 1) my sewing habits are somewhat sporadic throughout the year -- but generally with level of sewing activities and temperature outside enjoying a negative correlation (sorry for the geeky moment); and 2) having engaged mostly in "off-season sewing", I am planning on making more of an effort to sew "in-season". How about you? 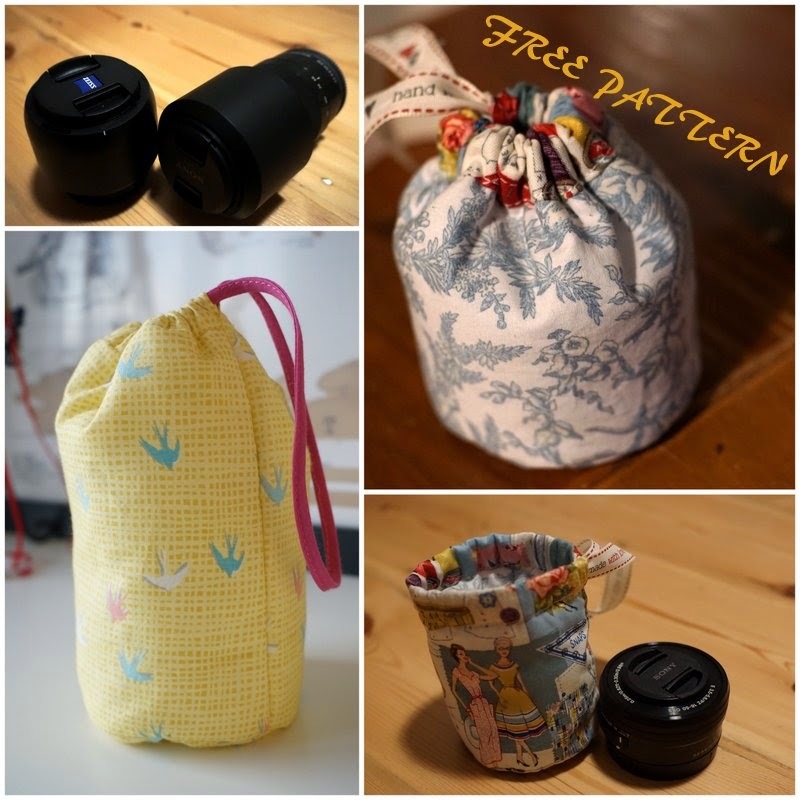 Do you sew seasonally? Lottie blouse pattern download still available... Be quick! Hello my friends! I hope you are having a great week so far. 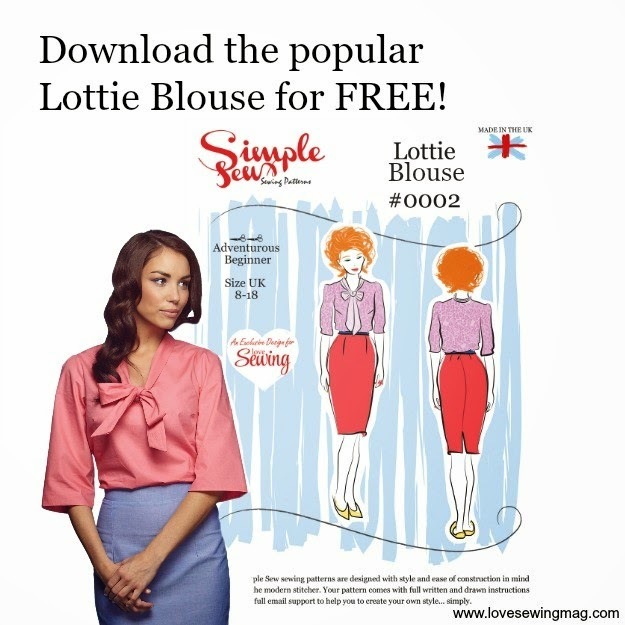 Just a very quick note from me today - I tried the link again and it appears that the Lottie blouse is still available for free download, despite the original deadline of last Thursday! Do hurry up and get your copy! Just to clarify - I am not on commission :) I just want to flag it now as I don't know how long it's going to last. I love a good freebie! Free PDF Lottie Pattern before 12 Feb! Anyone interested in a sew-along? I know I have only just clicked "publish" to my Giveaway post, but I have come across this wonderful freebie that I absolutely had to share with you! You may have seen lots of beautiful versions of the Lottie Blouse already (my favourites are here, here and here), which was originally given as a free pattern in Issue 2 of the Love Sewing magazine. I was just about to back order a copy online, when I came across the limited time FREE DOWNLOAD on the Love Sewing website!! All they ask is your email address, so they can send you newsletters and offers. You should be able to unsubscribe at any time. This is especially a great opportunity if you are based outside the UK and have been drooling over all the wonderful Lottie blouses all over the web, but are feeling left out. Now you can get your own pdf copy :) Just make sure you download it by Thursday. As this pattern is all free, and is no doubt a lovely pattern, I was wondering if anyone would be interested in a Lottie Sew-along, or a "Sew-together" (terminology borrowed from Sonja! ), if I were to host one? Just leave a comment below if you would be interested! Hello my dear readers, I am back from my holiday, and I have a quick giveaway for you to cheer us all up! This seems a long time ago now... (It was Sandy Island, where we spent a day and overnight enjoying the beach and wonderful snorkelling). All you need to do if you would like to take this pattern off my hands is to leave a comment to this post. Entries will close on Sunday 22nd Feb (midnight GMT) and the winner will be selected at random. I'm happy to post this worldwide. Let me leave you with a few more holiday snaps. Good times! The water really is this colour. We stayed for 2 days and 2 nights in Tobago Cays! Possibly the most special place we've ever been to on earth. 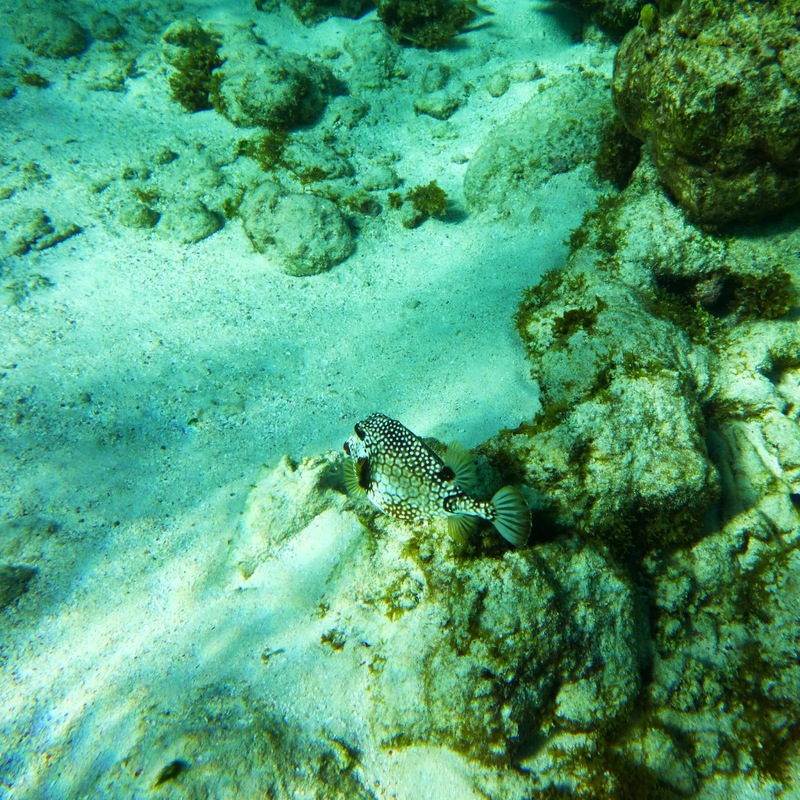 My snorkelling and swimming skills benefited so much from this trip - it helps when there are colourful fishes, huge turtles and interesting corals to look at. An iguana chilling in the tree of an inhabited island. And some hard-core hiking, too! We actually walked past a few abandoned flipflops along the way...!